Yoshinori Ohsumi of Japan won the the 2016 Nobel Prize for physiology or medicine. 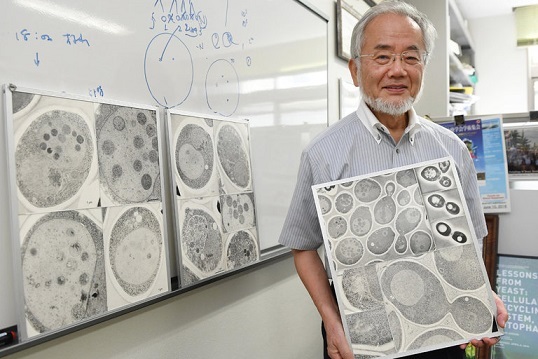 Ohsumi was awarded the prize for discoveries about autophagy - the study on how the body breaks down and recycles cellular components. His work gained significance as it helps explain what goes wrong in many diseases including cancer Parkinson's, and diabetes. The winners of the physics, chemistry and peace prizes will be announced later this week. The economics prize will be announced on the 10th of October. This year's Nobel Laureate discovered and elucidated mechanisms underlying autophagy, a fundamental process for degrading and recycling cellular components. The word autophagy originates from the Greek words auto-, meaning "self", and phagein, meaning "to eat". Thus,autophagy denotes "self eating". This concept emerged during the 1960's, when researchers first observed that the cell could destroy its own contents by enclosing it in membranes, forming sack-like vesicles that were transported to a recycling compartment, called the lysosome, for degradation. Difficulties in studying the phenomenon meant that little was known until, in a series of brilliant experiments in the early 1990's, Yoshinori Ohsumi used baker's yeast to identify genes essential for autophagy. He then went on to elucidate the underlying mechanisms for autophagy in yeast and showed that similar sophisticated machinery is used in our cells.